Download "NOTICE FIRST YEAR JUNIOR COLLEGE ADMISSION ( 2015-2016) FIRST MERIT LIST (ONLINE) GENERAL SCIENCE"
2 ..2.. H. SCHEDULE OF FEE PAYMENT Date of payment of fees : , , Time for fee payment : a.m. to 3.00 pm at College cash counter Fees : Students are required to pay Rs. 50/- ( non-refundable) as provisional fees and secure admission in the junior college. Sd/- PRINCIPAL NOTE: A) STUDENTS HAVE TO CONFIRM THEIR ADMISSION BY PAYING FULL FEES IN CASH ON OR BEFORE ( EXCEPT SUNDAY AND HOLIDAYS ) IN THE COLLEGE CASH COUNTER BETWEEN AM AND 1.00 PM. B) THEY HAVE TO PRODUCE THEIR PROVISIONAL FEE RECEIPT AT THE TIME OF PAYMENT. C) FIRST MERIT LIST FOR VOCATIONAL SUBJECTS (COMPUTER SCIENCE AND ELECTRONICS) AND FOR INFORMATION TECHNOLOGY WILL BE DISPLAYED ON AT 5.00 PM. Fees : Course Boys Girls General Science Rs. 1220/- * Rs. 650/- * Computer Science Electronics Rs. 1220/- (in cash) Rs /- (in D.D.) Rs. 1220/- (in cash) Rs /- (in D.D.) Rs. 650 /-(in cash) Rs /-(in D.D.) Rs. 650 /-(in cash) Rs /-(in D.D.) Information Technology Rs. 2420/- (in cash) Rs /- (in D.D.) Rs /-(in cash) Rs /-(in D.D.) D.D. 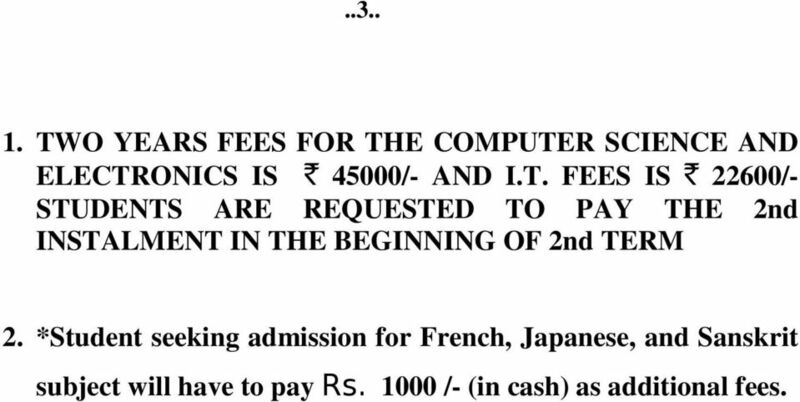 SHOULD BE IN FAVOUR OF SIES..3..
3 TWO YEARS FEES FOR THE COMPUTER SCIENCE AND ELECTRONICS IS ` 45000/- AND I.T. FEES IS ` 22600/- STUDENTS ARE REQUESTED TO PAY THE 2nd INSTALMENT IN THE BEGINNING OF 2nd TERM 2. 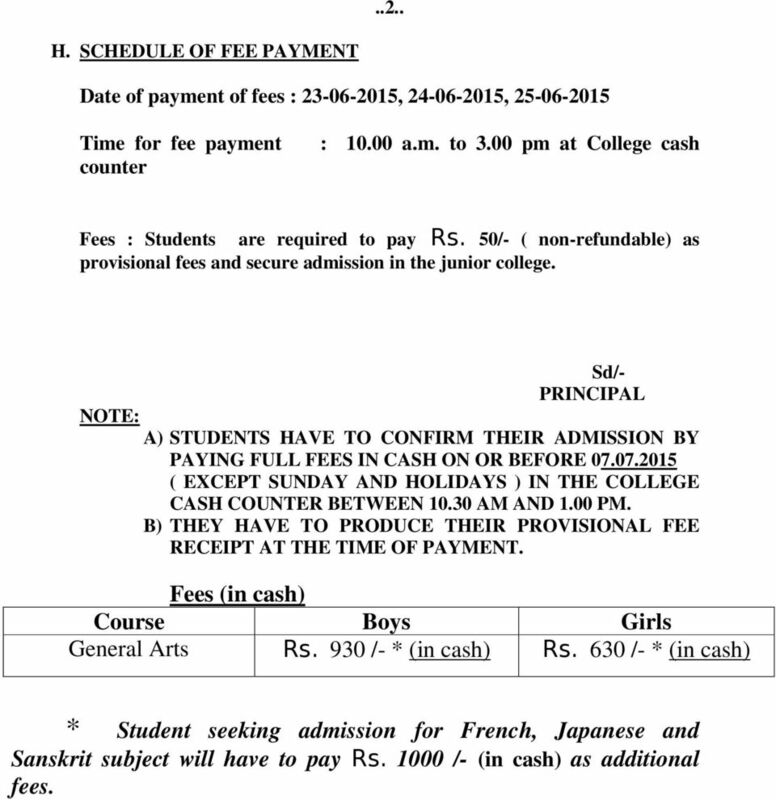 *Student seeking admission for French, Japanese, and Sanskrit subject will have to pay Rs /- (in cash) as additional fees. 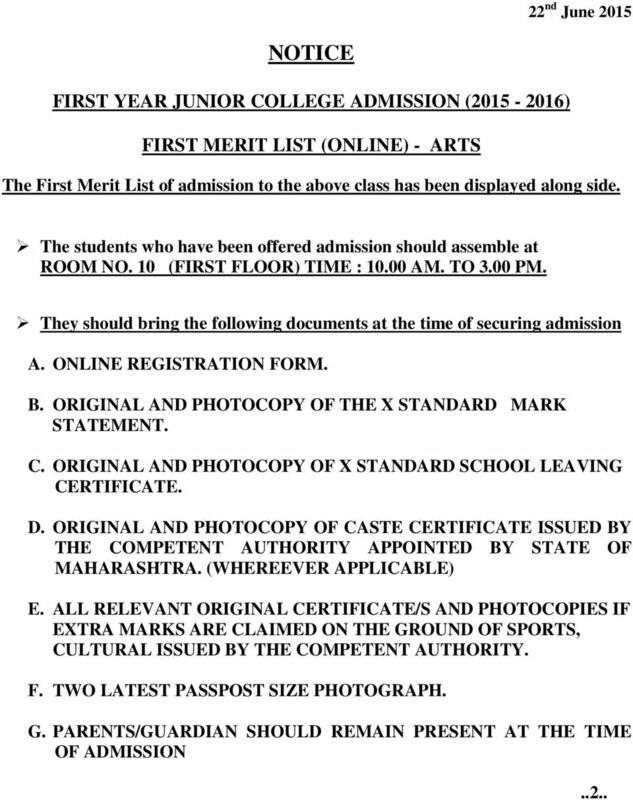 4 22 nd June 2015 NOTICE FIRST YEAR JUNIOR COLLEGE ADMISSION ( ) FIRST MERIT LIST (ONLINE) - ARTS The First Merit List of admission to the above class has been displayed along side. The students who have been offered admission should assemble at ROOM NO. 10 (FIRST FLOOR) TIME : AM. TO 3.00 PM. They should bring the following documents at the time of securing admission A. ONLINE REGISTRATION FORM. B. ORIGINAL AND PHOTOCOPY OF THE X STANDARD MARK STATEMENT. C. ORIGINAL AND PHOTOCOPY OF X STANDARD SCHOOL LEAVING CERTIFICATE. 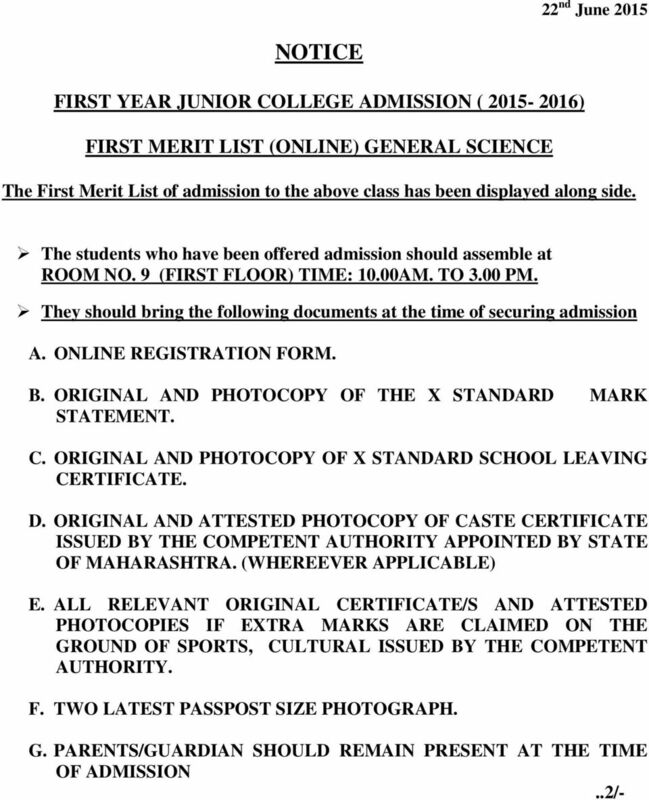 D. ORIGINAL AND PHOTOCOPY OF CASTE CERTIFICATE ISSUED BY THE COMPETENT AUTHORITY APPOINTED BY STATE OF MAHARASHTRA. (WHEREEVER APPLICABLE) E. ALL RELEVANT ORIGINAL CERTIFICATE/S AND PHOTOCOPIES IF EXTRA MARKS ARE CLAIMED ON THE GROUND OF SPORTS, CULTURAL ISSUED BY THE COMPETENT AUTHORITY. F. TWO LATEST PASSPOST SIZE PHOTOGRAPH. G. PARENTS/GUARDIAN SHOULD REMAIN PRESENT AT THE TIME OF ADMISSION..2..
5 ..2.. H. SCHEDULE OF FEE PAYMENT Date of payment of fees : , , Time for fee payment counter : a.m. to 3.00 pm at College cash Fees : Students are required to pay Rs. 50/- ( non-refundable) as provisional fees and secure admission in the junior college. 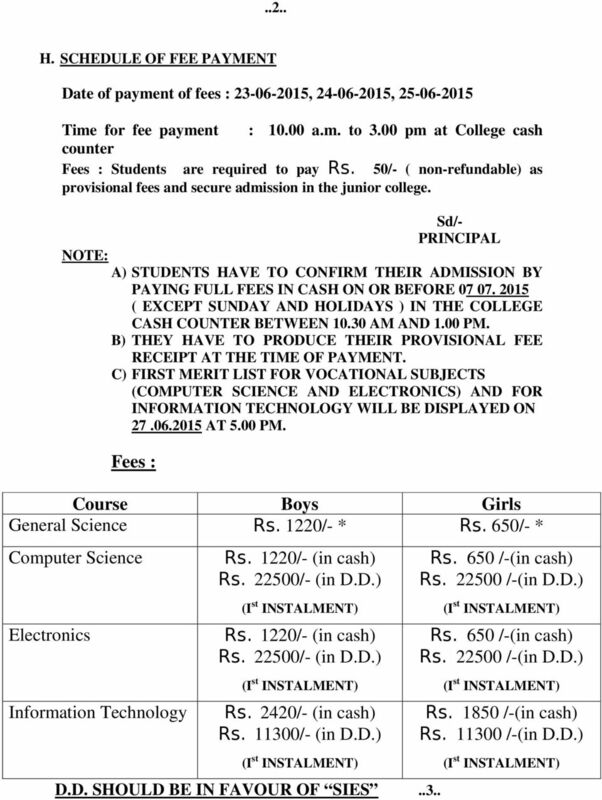 Sd/- PRINCIPAL NOTE: A) STUDENTS HAVE TO CONFIRM THEIR ADMISSION BY PAYING FULL FEES IN CASH ON OR BEFORE ( EXCEPT SUNDAY AND HOLIDAYS ) IN THE COLLEGE CASH COUNTER BETWEEN AM AND 1.00 PM. B) THEY HAVE TO PRODUCE THEIR PROVISIONAL FEE RECEIPT AT THE TIME OF PAYMENT. Fees (in cash) Course Boys Girls General Arts Rs. 930 /- * (in cash) Rs. 630 /- * (in cash) * Student seeking admission for French, Japanese and Sanskrit subject will have to pay Rs /- (in cash) as additional fees. B.Sc., Degree in Hospitality & Hotel Administration Admission for the Year 2015-16. ATTESTATION OF ACADEMIC CERTIFICATES FOR FOREIGN STUDENTS RETURNING AFTER COMPLETION OF COURSE IN STATE OF MAHARASHTRA. CALENDAR OF EVENTS / INSTRUCTIONS ADMISSIONS FALL 2015 MORNING / AFTERNOON PROGRAMMES. Time, Date and Place of Test. Morning 9:30 a. Department of Business Administration, Bhavnagar University, Mahatma Gandhi Campus, Bhavnagar 364022. Master in Business Administration. For admission to Private lnstitutes affiliated* to University of Jammu. THE GANDHIGRAM INSTITUTE OF RURAL HEATLH AND FAMILY WELFARE TRUST SOUNDRAM NAGAR, AMBATHURAI R.S. GANDHIGRAM (PO), DINDIGUL DIST.